A solider feels the costs of war. In the wasteland desert of Kuwait, I crammed my gear into duffle bags, preparing to fly into Iraq for a year-long deployment. At exactly the same time on the other side of the planet, my wife was giving birth to our first child. I packed ammo pouches, desert uniforms, and gas masks then I talked to my laboring wife on a satellite phone. I hurriedly packed trucks with more gear and made back to the phone center just in time to hear that labor had actually started. Then I hopped onto a bus and headed to the air base. Arriving at the air base, we were told there actually was another phone center available. My heart jumped and I started to sweat, wanting the briefing to be over immediately. The arduous speeches and warnings finally done, I absconded from assisting my Idaho National Guard comrades in their gear palletizing duties, and sprinted to the phones. When I called, Sally’s contractions in the Boise hospital room were coming faster and stronger. I burned through my third prepaid phone card of the day and had a dinner of a breakfast bar and some Army peanut butter, which was the only food in my pockets. Finally, after many calls and through the cheers of friends who were with her through the delivery, I was able to hear my daughter’s first wails from 7,000 miles away. Two hours later, we boarded a transport plane and flew into a war zone. As I sat in the near darkness, lit only by one blue light near the front of the aircraft fuselage, I thought flatly, I’m a daddy. The words rang hollow in my head, then they quickly slipped away as I focused instead on the long deployment ahead. Over the next five months,I had to forget about home and focus on the missions at hand. I eased Humvees through rain-soaked palm groves and over slick mud roads, shivered in guard towers through freezing winter dawns, and once spent 22 hours guarding a polling place during Iraq’s elections. Throughout it all, I received plenty of photos of Lillian from Sally. But looking at them, I could only think,Okay, we have a baby. I am a father.I felt little more than apprehension. I couldn’t stop wondering what it meant to now be a father to a baby girl, or at least to a stack of photos of her. On one hand, I had dreamt about having a child all my life—I ran over the scene in my mind so often that I long ago determined exactly what I would say to that newborn. I often envisioned picking her up and whispering three specific things into her ear. But on the other hand, I had no idea what it meant to be a father, as I was brand new to babies. I had zero experience handling, caring for, or loving little ones. My only knowledge of babies was hearing them cry in airplanes and seeing them throw food in restaurants. The few babies I knew—friends’ children and my own niece—were all born while I lived far away. I was training with my National Guard unit during Sally’s entire pregnancy so I missed the nine-month ramp-up that allows most people to attempt to mentally prepare for parenthood. Sitting in Iraq with scattered photos of a newborn, I could recognize that I had a daughter, but I had no idea what that really meant. At last, I left Iraq, heading home for two weeks of leave. After 69 hours of processing, paperwork,briefings, repeated customs drudgery, ten time zones, four countries, and travel in Humvees, buses, two cargo planes, and three commercial jets, I walked up the Boise airport jet way, still dressed in desert camouflage, embraced Sally, and saw a baby in a stroller behind her—my five-month old daughter, my first child, Lillian. “Who’s this?” I shouted, both out of the exuberance of being home and unabashed pride in meeting my daughter. For me, this was the emotional equivalent of the day of her birth. I picked her up so carefully, gave her a gentle hug, and followed-up with a quick smooch on the cheek. We immediately found seats right in the terminal, passing a woman who, having overheard our exchange, was trying to hide her tears. A United ticket agent took our picture, our first family portrait. That day was full of firsts: the first family meal, the first smooch on the nose, neck, etc., first daddy/daughter play time, and the first diaper change. We took photos of every bit of it. But laying awake that first night, joyful to be able to reach over and hug my wife, drink clean water from a tap, sit out in my yard to watch the sun set over the Idaho foothills without having to worry about roadside bombs, I still did not know what it meant to have Lillian in my life. The next morning, I began to find out. Waking up far too early, still jet-lagged, I woke and went into our baby’s room. As I approached her crib, Lillian’s eyes locked onto mine. She smiled, issued a lilting little coo, and then yawned a tiny yawn, complete with a flailing stretch of her plump arms. I melted. I told Sally that I almost cheered when a determined Lilli Bean fumbled her way into finally getting her pacifier into her mouth the right way. I said that, every day, I became more and more enraptured just watching her grow and learn. I loved that each time I held her up on her feet I helped her develop equilibrium, and each time I made a funny noise I helped her learn about speech. I knew that I wanted to spend every possible moment of my time with her, teaching her, guiding her, fortifying her to someday unleash her own unique self upon the world. But you’re never really, completely home while on leave, because you cannot stop thinking about the march of time that drags onward, pulling you closer to going back to war. You are like a condemned man, constantly aware of the passing of days, then hours, yet trying to forget it all and enjoy what moments you have left at home. Just as I was starting to learn what fatherhood was, my time was up. The night before my return flight,I mechanically packed my bags, and slipped into bed around 4:00 a.m. for a few hours of trying to sleep, my stomach sick, a sodden ball of knots. Two hours later, I put on the uniform, laced up the boots, and, contrary to everything that my soul knew was true, contrary to the voices in my mind screaming to do otherwise, I stepped out of my home, stepped into the airport, stepped onto a plane. After 72 hours of travel on five different flights, reams of paperwork, and incessant waiting in line after line of similarly camouflage-clad soldiers, I was back in the Middle East. Returning to my base, I felt empty. Seeing my friends and having them welcome me back helped but it still took a few days to get back into the groove of patrols, Quick Reaction Force response teams, knock-and-search raids, and guard duty. But the deeper emotional damage had been done. While it was easy to ignore Lillian before, not knowing who she was, it was impossible now. I heard the laughter and the coos behind the smiling photos pinned next to my bunk. I now knew a little bit of the tiny girl in those pictures and I missed her deeply. Soon after my return, my squad drew an extra graveyard shift of guard duty at the summer palace of Chemical Ali, the Saddam henchman responsible for gassing thousands of Iraqi Kurds. Around 3:00 a.m. I stood alone atop an abandoned building in the tightly-packed urban compound. By chance, I looked down into the courtyard of one of the homes across the street. In the dim light of the few working streetlights, I saw a mother with her fussy newborn, rocking him on a porch swing. I felt sick. I was disgusted that I was missing such moments with my baby. My mind raced, trying to calculate the time I had left here. It was still several months. I tried to stop thinking about it. I walked the rooftop’s perimeter, machine gun in hand, trying to calm down. Finally, I tiptoed toward the edge, just close enough so I could see her over the rooftop wall. I tried looking nonchalant, like I didn’t even notice her, but I just kept staring, watching her rock and sing to her child. I was mesmerized, and aching inside. At last, she noticed me and, probably assuming that I was just another lust-filled, gawking soldier, went briskly inside. That empty night crept by in excruciating slowness like none before. While simply difficult before leave, the days in Iraq now became interminable. Under the hot sun, I stood sweating in the gunner’s turret of an armored Humvee and worried if Lillian was sleeping well. I stood lonely vigil in concrete guard towers, wondering what she was learning that day. I roamed the empty nighttime streets of Kirkuk, wondering who she would be when I got home. I did what I could to make the days pass—lifting weights, running supply convoys, watching laptop movies, reading books, and always patrolling. But the days dripped past with an agonizing slowness. Some relief came from a used webcam.Several weeks after leave, we had a wireless Internet network installed and soon we were all surfing the Web and emailing loved ones directly from our bunks (indeed, this was certainly not our fathers’ war). Each night (Sally’s morning), I watched Lillian nurse, or nap angelically on the pillow in Sally’s lap. She would occasionally lunge, grab the camera and stick the whole thing in her mouth, allowing me a glimpse of her two brand new teeth. When Lillian was fussing, Sally texted me about how she cheered up our daughter by holding her upside down. I would see (but not hear, since I didn’t have audio) her screaming wails of laugher on my laptop screen. Soon “Upside-Down Baby” became a hit with my whole squad, sometimes with grown men running into our squad bay once they heard that ‘Upside-Down Baby’ was on. Many night,s I had several soldiers, young and old, gathered around my computer for a chance to see my daughter’s bit-mapped, upside-down face, plastered with a huge, screaming smile. The webcam was also a nightly reminder of my absence, however. Its images were both treasure and torture. Seeing Lilian’s digitized smile made me ache. One night I saw her stand for the first time, another night she drank water from my wife’s cup, yet another night brought my first glimpse of her eating solid food. I started to understand just how many miniature victories and tiny triumphs I was missing every day. I watched her grow and learn and thrive from ten time zones away, while concussions from car bombs rattled our barracks windows. Lying in my bunk, I stared at the photos tacked to my plywood wall and was heartbroken every night. Not only had I forgotten to tell Lillian those three little sentences that I’d so long dreamed of telling my first child, I was missing so many more milestones as she started to grow into a little girl, all while I ran about in Humvees on the other side of the world, hoping each day that someone wouldn’t blow me up, or simply pop out of a doorway and shoot me dead in the face. Harder still was hearing about the difficulties my wife faced every day. While even her good days were a chore, the bad days were horrid. For most of the deployment, she was taking care of both house and baby alone. The car needed repairs, the grass had to be cut, the floors needed vacuuming, and the bills needed to be paid, all while Sally, alone, maintained the constant eat/sleep/excrete cycle of an infant. Since our families both live far away, we leaned heavily on good friends in Boise, one of whom had to come over in the middle of the night when Sally was stricken by a wicked bout of food poisoning. That woman stayed over to care for Lillian and my wife for two days. When I heard about sickness or simply heard Sally blurt on the phone, sometimes through tears, “I just want to take a nap” (or take a bath, or read a book, or simply get away from here for a little while), I felt like I had been punched in the gut. I wanted to help, to do something, anything, to just be there for her, to simply take Lillian while Sally showered, or slept, or went out for a solitary hike. But, stranded as I was on the other side of the world, there was nothing I could do. Slowly the countdown to our departure dateticked down from triple-digits, to double, and then, almost unbelievably, to single days. Our stoic, stone-faced replacements arrived and, soon, we cheered the takeoff of each flight toward home: the transport to Kuwait, the chartered jet through Ireland to Fort Lewis, Washington, and then one last, short flight back to Boise. Amidst the signs and balloons of the small crowd of families gathered on the tarmac, I found my wife. We didn’t say a thing, just held each other and kissed and kissed and kissed and kissed. After loading my duffle bags into the back of our car, Sally offered Lillian to me and I held my daughter in my arms again, gazing into her big gray eyes. Wide-eyed, she stared back for a moment, then turned to her mother and pushed me away. She didn’t know who I was. Lillian not knowing me is but one of the myriad intangible casualties of warfare and as old as warfare itself. 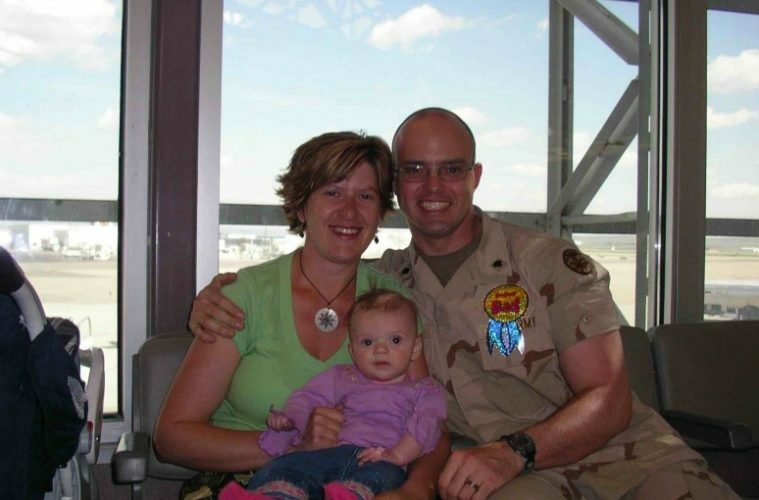 Two other soldiers that I deployed with also missed births of their children. Sixteen years before I missed Lillian’s birth, a former Marine in my unit stood knee-deep in blowing snow in a rice paddy in Korea when another Marine handed him a telegram and said curtly, “Congratulations.” The telegram said he’d had a son born that day. He smiled, put the telegram in his pocket, and kept on training. (He still has the telegram.) While my father was missing his share of his children’s birthdays and a wedding anniversary during his year-long stint in the highlands of Vietnam, he had only letters and the occasional reel-to-reel tape recording with which to stay in touch with his family. In Iraq, there were 4,000 other people in my Brigade, 150,000 soldiers deployed in Iraq that year alone, and that was just one war, one war of so many. While the terrible numbers of deaths by roadside bombs, vehicle rollovers, and helicopter crashes was (rightly) spread across the front page and technicians at Walter Reed Medical Center tracked the total number of limbs lost, there are no statistics for the even more numerous intangible costs of war. No one counts the number of nightmares veterans will have for the rest of their lives, forever plagued by incoming RPG rounds, burning Humvees, and charred pieces of children. No one keeps count of veterans’ total divorces and break-ups, the newfound paranoias, the discomfort around fireworks and automobile backfires, the flashbacks, the spousal abuses, or the alcoholic benders. And no one will count the days that all those military parents missed playing with children far, far away. For me at least, I had made it home whole and I could start counting anew the days spent with Lillian. Iraq began to fade, ever so slowly, into memory as I jumped into a few weeks of accelerated ‘Daddy School’ where Sally taught me how to feed our daughter, play with her, get her into and out of her car seat and secure her while she slept.